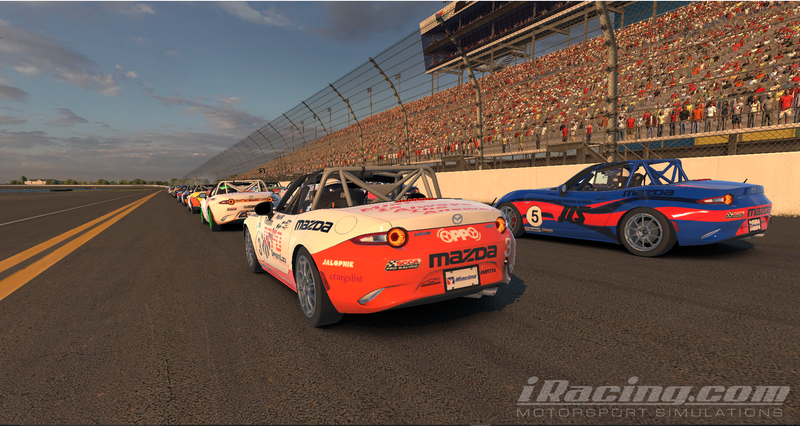 After picking up our Miata off Craigslist, Team Oppo came to Daytona on Saturday and competed in the iRacing Roar Before the 24. We were gridded 45 out of 60 cars and roughly 14th out of 22 Miatas. Ahead was 2.4 Hours (144 Minutes) of racing. The competition was tough. Not only were we competing with the other Miatas, but there were also Kia Optimas and Mustangs out on course running their own race. Below is a photo gallery of our event. I might need to mark this NSFW because there is a lot of pounding on the back end. As we come to the green flag, the classes spread themselves out. We then go thundering into the first turn. And 400 feet into the race we have been smacked in the rear. So much for that straight bodywork. The first part of the race was very tumultuous with everyone stacked together. A lot of drivers were trying to get as many positions as they could. This naturally lead to much contact. Well there went the fender. Some people believe that going forward is for squares. At this point the Kias (the fastest group) had caught us. 20 Kias catching 20 Miatas at the same time is terrifying. The Kias are roughly 30 seconds per lap faster than the Miatas which means they catch them very quickly. 3 Wide into Turn 1. This should go well. The biggest thing to happen to everyone during the race was a massive server fault. I want to thank my CAT6 Ethernet cable and Google Fiber for keeping me in the race during this time. This helped eliminate some of the competition; although not really fair, I will take it. I made one big mistake during this event. As shown in the picture above, I was leading a draft of Miatas when a Kia came up. This was approaching Turn 1 and I didn’t see them coming. I looked up in time to see the Miatas dive down. As I began to move low, I saw the Kia dive down. I panicked and shifted back up the track. Needless to say, the rear of the Miata got rearranged. Good things these traffic cones were here to slow me down. As you can see, this mistake did cause quite a bit of damage. I had no idea the trunk had been redesigned. Thankfully the fuel tank was not punctured. There was significant aero damage which put the car about 2 seconds off pace. However, the engine seemed fine and the car tracked straight. Time to bring the car to the attention of the Oppo crew. The Miata could make it roughly 99 minutes on a tank of gas. My strategy was to fill the car with enough gas to make it to the 90 minute to go mark, then stuff the car full gas and tires and run it out. Unfortunately, I added some body work to the pit stop which the crew did a marvelous job of repairing. After nearly a 90 seconds of putting gas in the tank and hammering the trunk back down, the car was ready to go back. The slight delay in body work repair put me back out a little bit behind where I was. However, it was fairly quiet with little traffic. This is where I hung out most of the rest of the race. It was a nice Saturday afternoon drive. The end of the race saw a great battle between another driver and I fighting for position. With 2 laps to go, a bit of positional and psychological trickery resulted in the other driver going wide in Turn 1 and I ran away with the position. I will take that position, thank you. After 2.4 hours of racing, Team Oppo came home 6th place in class. It was a decent run; even given my massive screw up. The car and the setup were pretty good, and really the only thing that held us back was my poor road racing abilities. The 2.4 Hour event is a great challenge for road racers. The race distance is enough to make drivers enter an endurance racing mindset. Strategy and patience are crucial, far more than raw speed and aggressive driving. It enables drivers to adapt to constantly changing situations. It rewards attrition and consistency. Below you will see the state of our glorious Miata before and after the race. Left: Car Before the Race; Right: Car After the Race.